Anyone who has read this blog for a while knows that I am fascinated by the mutualism that seems to be all over creation. You can seem some of my previous posts about this topic here, here, here, here, and here. I recently came across a study that provides another example of mutualism in one of favorite habitats: a coral reef. As an amateur scuba diver, I spend a lot of time enjoying the wonders of coral reefs, and the more we study their biology, the more amazed I am at the interconnectedness that exists among their inhabitants. The authors of the study were trying to understand how a very common species of coral, Acropora nasuta, protects itself against the toxic seaweed Chlorodesmis fastigiata. This particular seaweed attempts to take over a coral reef by producing chemicals that harm the coral. The chemicals reduce the coral’s ability to grow and feed, allowing the seaweed to “muscle in” on the coral’s turf. When the seaweed is completely successful, it chokes out the coral, forming a shrubby thicket where the coral once was. As the authors note, previous studies have already shown that overfished coral reefs are more likely to be taken over by such seaweed, so they wondered if perhaps the fish that live in the coral reefs provide some sort of protection for the coral. They found that certain species of goby (particularly the broad-barred goby, Gobiodon histrio, and the redhead goby, Paragobiodon echinocephalus) do, indeed, protect the coral from the seaweed, but the process by which this happens is rather surprising. The authors started by enclosing different corals with nets. Some of the nets also enclosed crabs and fishes that normally live with the corals, and some of the nets enclosed only corals with no crabs or fishes. They then introduced the seaweed (as well as a clump of nylon string as a control) to the corals to see what would happen. 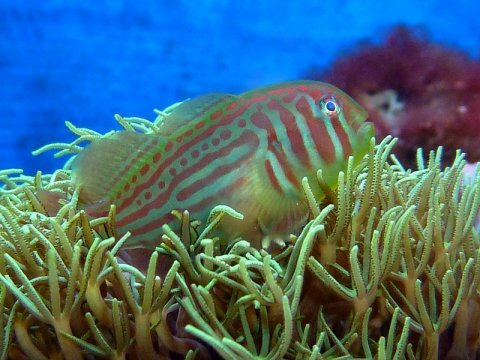 After three days, the corals enclosed with the two species of goby had 70-80% less seaweed-induced damage than the corals that did not have those species in their enclosure. The crabs (whether with or without the gobies) had no measurable effect on the amount of seaweed-induced damage. So the two species of goby seemed to be having some sort of protective effect on the corals. Is this because they naturally eat the seaweed? Probably not. The authors examined the digestive systems of the gobies that were enclosed with the seaweed-infested corals and found something quite interesting. The vast majority of the species known as Gobiodon histrio had remains of the seaweed in their systems, indicating that they ate the seaweed to protect the coral. However, none of the other species (Paragobiodon echinocephalus) had any seaweed in their digestive systems! To further complicate the picture, when the authors examined Gobiodon histrio individuals that were not enclosed with the corals and seaweed, they found no seaweed remains in their digestive systems, despite the fact that the seaweed was available for them to eat. The researchers therefore concluded that one species of goby (Paragobiodon echinocephalus) chews on the seaweed to protect the corals, but then it doesn’t swallow! It just spits out the seaweed. The other species of goby (Gobiodon histrio) does eat the seaweed, but it doesn’t seem to do so on a regular basis. In both cases, the gobies attacked the seaweed specifically because the corals needed help! Thus, the gobies serve as bodyguards for host corals, and the coral chemically cues gobies to attract them to the site of coral-algal contact where they begin removing the alga within minutes of seaweed contact (or contact by the seaweed’s hydrophobic extract alone). The authors liken this mutualistic arrangement to another one that I have discussed – the bodyguard arrangement that ants have with Acacia trees. So in the end, then, we have a very sophisticated arrangement that exists between at least two species of goby and a species of coral. When the coral is threatened by seaweed, it releases chemicals that call its bodyguards. One of those bodyguards (Gobiodon histrio) will eat the seaweed, even though it doesn’t seem to eat the seaweed under normal conditions. The other (Paragobiodon echinocephalus) won’t even eat the seaweed! It just chews it up and spits it out. It spends time and energy doing this because it somehow “knows” that its own life will be better if the coral survives. From a creationist or intelligent design point of view, this kind of relationship makes perfect sense – the gobies and corals were made for each other. They can communicate because they were designed to live together and support one another. The more we study creation, the more I am amazed by the handiwork of its Creator! Impressive. Yet another tribute to how perfect the design of our creator is!